The last year has been a wild ride for Modern Baseball. The success of You’re Gonna Miss It All catapulted the band from heroes of the punk underground to being buzzworthy mainstream talent will all the hype of the internet behind them. Somehow, the band has managed to keep their heads level through it all, and their latest video pokes fun at the various vultures who have circled their success over the last few months. You may remember “Rock Bottom” as one of the opening tracks on You’re Gonna Miss It All. It’s the kind of song that plays like a diary entry set to music, with lyrics reflecting life and the awkwardness of growing up when you know you’re not the same as everyone else. 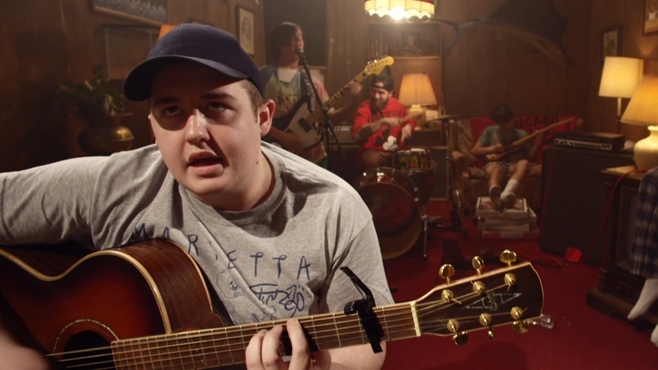 The video finds vocalist Brendan Lukens performing the song while a series of cliche high school scenes are acted out behind them. Before the song ends, Lukens breaks free from the set and metaphorically abandons the pre-conceived notions people have about the music his band creates. You can view the video below. You’re Gonna Miss It All is available now through Run For Cover Records.